Coming along the main village street of Glynde, past cottages and an almost absurdly quaint smithy with horseshoe-shaped doorway, there is an abrupt change of gear when you reach St Mary’s church, a Palladian structure of the 1760s, which itself acts as a kind of prelude to the cupola-topped Georgian stables of the big house, Glynde Place, just a little further beyond. The west front of St Mary’s is all triangles and semi-circles. It would be a rather severe exercise in Palladian geometry, but its small size tempers the severity and gives it charm. The architect was an amateur, Sir Thomas Robinson, and he made good use of flint for the main walls and neat ashlar for the porch and the triangular pediments. 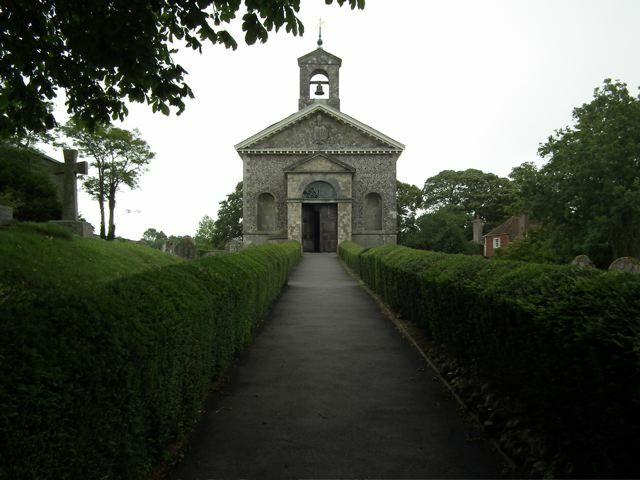 Like virtually every church architect using this kind of classical architecture, Robinson found no real solution to the problem of combining a “classical temple” frontage with a bell turret. So the turret looks a bit odd atop the pediment, but its triangular top and semi-circular arch echo the triangles and arches below, giving the design some consistency. The charm continues inside, with an interior full of box pews that features a wooden west gallery and other Georgian furnishings. 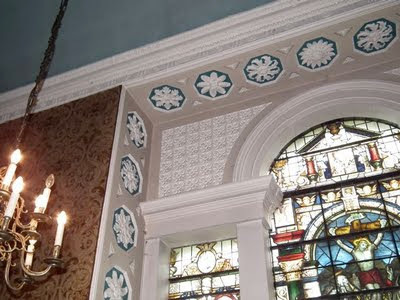 Best of all is the plasterwork around the east window, with its rosettes set in octagons. This is a lovely touch and isn’t quite spoiled by the stained glass by Kempe, in a sort of Renaissance revival style of the 1890s, which would look better in a Victorian church. But even it includes semi-circles and triangles, continuing the geometrical theme and maintaining a certain harmony. As a final post in this short series about buildings in the Ludlow area of Shropshire, here’s the interior of the parish church of St Michael at Onibury, a mainly 14th century church, but with older portions, such as the very plain chancel arch, surviving from the Norman period. Still more visual impact, though, comes from the restoration at the beginning of the 20th century. And, unlike many church restorations, this was very much for the good, because the job was done in the Arts and Crafts tradition by Detmar Blow. It’s the furnishings that catch the eye – oak pews and stalls, lights on upright posts with simple metal and glass lampholders, and the elegant west gallery, its front a grid of oak verticals and horizontals. 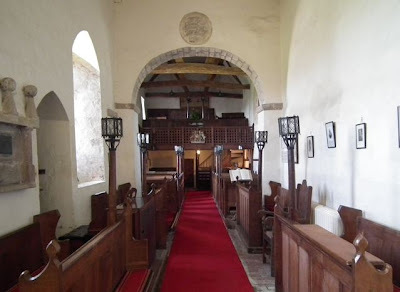 Blow’s fittings beautifully set off the pale plastered interior with the semi-circular chancel arch and the rough but beautiful woodwork of the nave roof, just visible beyond the arch in my photograph. 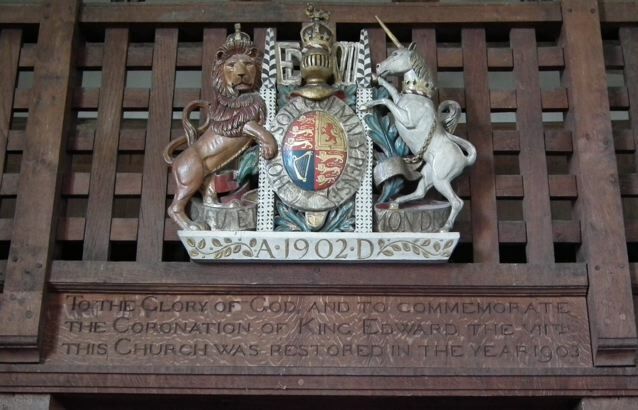 A finishing touch is provided by the royal arms of the then new king, Edward VII, with their characterful lion and unicorn supporters. 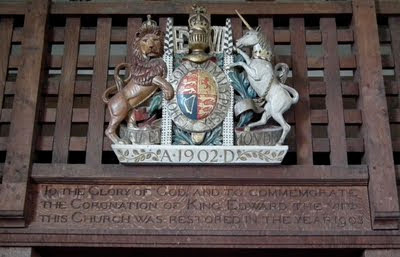 There’s so much going on in these arms – don’t miss the king’s monogram, ‘ED VII’ on either side of the helm and crest at the top; or the elegant black and white uprights (I’m not sure of the correct heraldic term) on which the lion and unicorn lean; or the foliage on either side of the date at the bottom. It’s an accomplished design carried out with painstaking attention to detail: art and craft indeed. Although Stokesay Castle (see also my previous post) is a 13th-century building, some major alterations were carried out in the 17th century, when it belonged to the Craven family. In about 1640–41 they built the charming gatehouse (above). 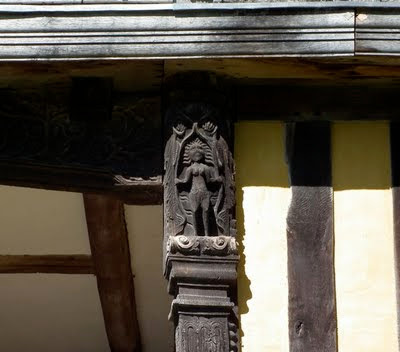 This timber-framed building is very like a lot of the houses in the nearby town of Ludlow – generously timbered, with added carvings. The decoration here have an Adam and Eve theme – there are ‘Fall of Man’ carvings along the lintel as well as portrayals of Adam and Eve on the brackets on either side of the main archway. There are other figure carvings, and also dragons, elsewhere amongst the woodwork, making this a one of the most richly ornamented buildings of its type. 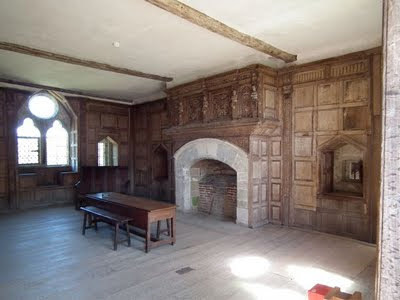 The other 17th-century part of Stokesay Castle is the decorative scheme in the solar (above), the main upstairs living room. This room, part of the original medieval house, is accessed by the outer stairs between the main hall and the south tower. In the 17th century it was panelled in oak and a very elaborate carved overmantel was installed above the fireplace. If the carving on the gatehouse is impressive, the overmantel is riotous. On the pilasters, bare-chested human figures look out across the room; between them are intricate patterns of carved oak, with grotesque heads as centrepieces; more high-octane carving fills up the gaps. This piece of show-stopping display is broadly classical in its proportions – see the architrave above the figures – but this is the kind of homespun classicism popular in the 16th century. Architecture textbooks will tell you that the real action by the mid-17th century was with much more correct and Italy-aware kinds of classicism – Inigo Jones facades and hipped-roofed houses. But not here at Stokesay. There’s some evidence that this carved decoration was brought here from elsewhere, so it may have started life a few years before being installed here. Even so, a high-status family wanted to install it in one of their most important, showy rooms. 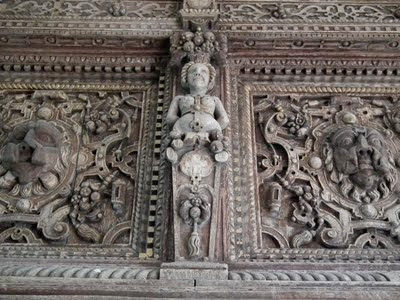 This remarkable overmantel shows that, in the far west of England in the mid-17th century, this older kind of expressive, eccentric carving was still alive and vigorously kicking. A number of people have asked me, in comments on this blog and personally, about why the term “solar” is used for a room in a medieval house. The word goes back a very long time, variants on it being used in this way in Old English, i.e. before the Norman Conquest. This isn’t immediately apparent from the Oxford English Dictionary, though, because the dictionary does not list this use of the word with the various familiar modern sun-related uses of “solar”; instead, the OED lists it as a variant spelling of “sollar”, which means the same thing as our architectural “solar”: an upper room or apartment in a house or other dwelling. The OED says that the word was originally used for a room “open to the sun or receiving much sunlight”. Medieval solars in my experience aren’t particularly sunny, but they’re always upper rooms, so at least they are a few feet nearer to the sun than those on the ground floor. Etymologically “solar” is an interesting word because it might have been introduced into the English language twice. There are words like “solor” and “soler” in Old Saxon and Old High German, from which our Anglo-Saxon ancestors got the term before 1066. But the Normans might have brought it with them too, because it’s present in various early Romance languages, in Old French as “solier”, and in Anglo-Norman as “soler”. There is more information in the OED entry on “sollar”, for those with access to the great word-hoard. Stokesay Castle is one of my favourite buildings, and has been since when I first visited it, long ago when I was a teenager, in the pouring rain. I’m pleased to say the weather was much better for my most recent visit, and the bright light inspired me to take some photographs not just of the exterior of the building but also of a couple of the interiors. 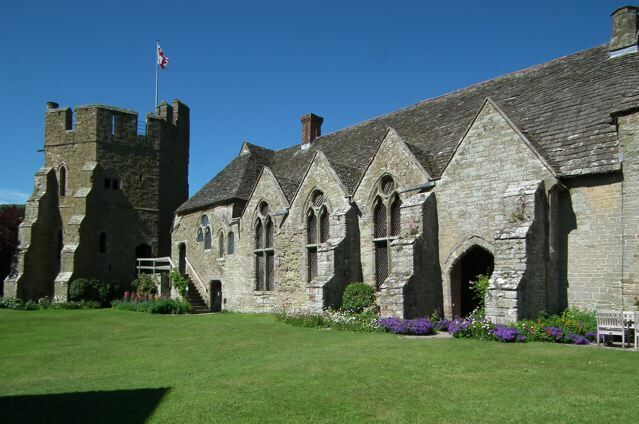 As many of you will know, Stokesay Castle is not a castle at all, but a fortified manor house. Although has a crenellated tower and a defensive moat, it lacks the strong fortifications and tiny windows of a true castle and would not have withstood a full-blown siege. 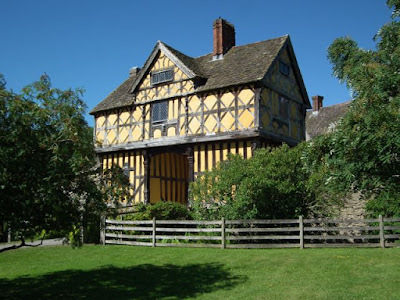 Stokesay was built in the 1280s and 1290s by Laurence of Ludlow, a wool merchant who had done so well that he had become one of the richest men in England. He built this house to give him a degree of security and to act as a status symbol. Slightly showy, but not vast enough to make the aristocracy jealous, this house was built to show that the Ludlow family had arrived. Remarkably, much of Laurence’s house of the 13th century, including the chunky polygonal south tower, the solar block, and the hall with its linked north tower, survives. In the picture above of the south tower and hall, only the big buttresses and the outer stairway up to the solar are later additions. The big Gothic windows light the most important medieval room: the hall. Here, beneath this glorious roof – many of its original timbers are still in place – Laurence and his family would have gathered for meals with their household of maybe 25 people. Laurence and his family and their guests would have sat at the high table at the far end of the room; the rest of the household would have used two long tables placed at right-angles to it, running along the length of the hall. Their food was prepared in a kitchen nearby (no longer standing) and wine and beer came up from a buttery on a lower floor, just off the hall. This room would have been the social centre of the house, heated by a hearth in the middle of the floor that was the symbol of commensality and hospitality as well as the literal source of heat and light. For several centuries the hall was loud with conversation and, probably, music, and alive with the comings and goings of servants. But the bustle is long gone. The house has not been lived in for some 200 years, although it was kept in good repair by benevolent Victorian owners who lived in a more modern house not far away. They ensured the survival of this spacious hall, lit by its two rows of tall Gothic windows, its roof is supported by great cruck timbers tied together by pairs of horizontal collars and curving braces. 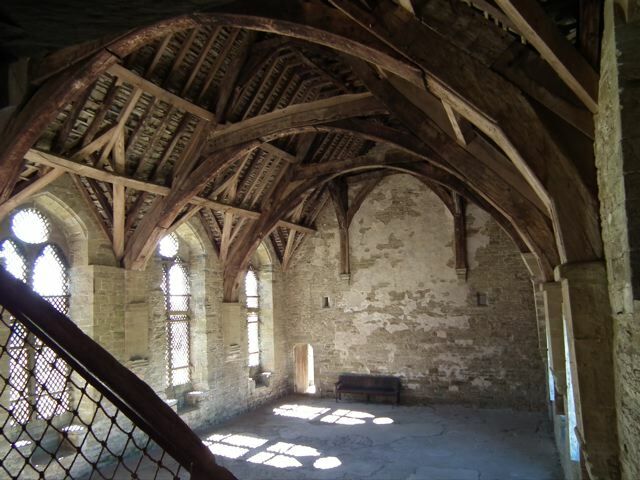 This structure creates a beautiful space and even in its emptiness, the hall at Stokesay is one of the most evocative rooms in England. Having been cared for by the Allcroft family from 1869 to 1986, Stokesay has since been under the guardianship of English Heritage. It’s the 1670s. The English Civil Wars have come and gone and the Stuart monarchy has been restored. In London, the great fire of 1666 has left its trail of damage, but the capital is being rebuilt. Wren’s new city churches are showing people how a kind of plain classical style can be adapted to church design. People are used to simple interiors, a minimum of imagery, and texts on the wall. If there is ceiling decoration, for example, it’s plasterwork not a million miles away from the kind of thing found in country houses of the period. 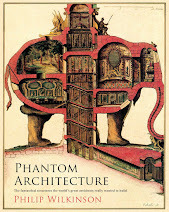 But English architecture can always produce something against the grain, something that throws away the rulebook. In the unlikely setting of the Shropshire countryside near Ludlow is a startling example. 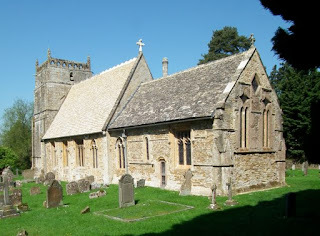 St Mary the Virgin, Bromfield, is a medieval parish church, once a Benedictine priory, originally built in the mid-12th century with later additions from the 13th and 16th centuries. There’s a solid-looking stone tower at the northwest corner, a nave, an aisle, a chancel – nothing unusual-sounding about all that. What is unusual is the chancel ceiling, a celestial phantasmagoria of angels and clouds, each angel with a scroll bearing a Biblical quotation. This heavenly host was painted in about 1672 by Thomas Francis of Aston-by-Sutton, Cheshire. It combines the period’s taste for texts with a kind of angelic imagery that’s like little else. The angels are a varied bunch, some apparently naked, others draped in rural homespun. The scrolls bearing the texts curl this way and that across the sky. 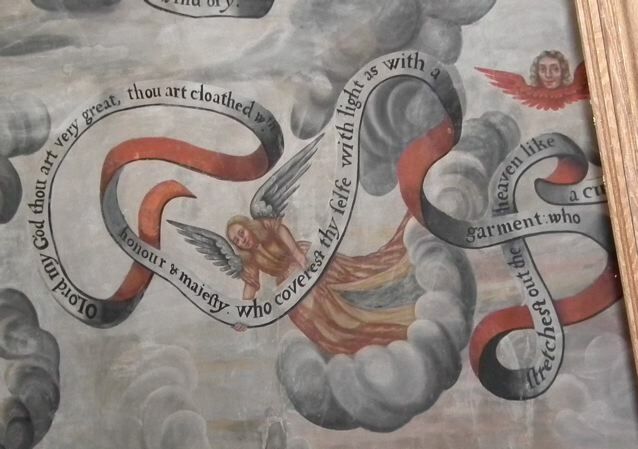 At the centre, amongst the English country angels, the fluffy clouds, and the eccentrically scrolling texts, is a bit of Latin. It’s a diagrammatic explanation of one of Christianity’s greatest puzzles: the Trinity. 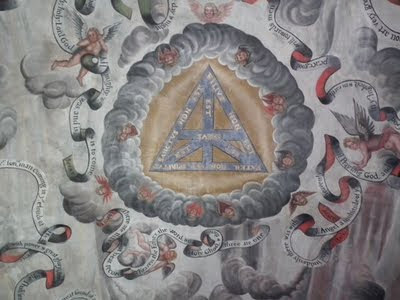 If you follow the diagram, which is often known as the Shield of the Trinity, you will read, around the edge, that the Son is not the Father, who is not the Holy Spirit. But if you read inwards towards the centre you will discover that each of these is God. 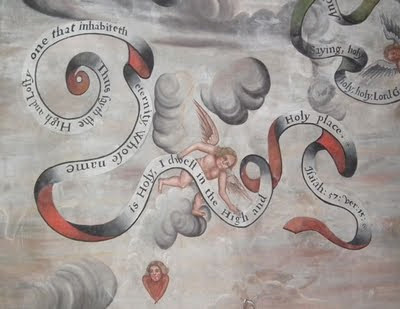 The whole ceiling is a remarkable combination of English and Latin, angels and clouds, folk art and exegesis. It’s mixed up but wonderfully surprising. And its charm is unique. I've added another page to this blog, accessed as before either from here or via the PAGES menu in the right-hand column. It covers the architecture of the first three-quarters or so of Victorian period – roughly up to 1890. I plan to deal with the end of the Victorian era and the first two decades of the 20th century together on another page. 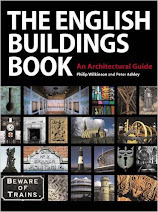 As with previous round-up pages, you'll find a brief description of the key features and styles of English architecture during this period, with links to examples that I've included on posts in this blog. Because the subject is the 19th century, this round-up is necessarily very sketchy: this was a period in which so much was going on, with buildings of almost every type being built in almost every style. So this is a brief and selective summary, but one that points in many directions that I hope will be interesting. As one recent commenter remarked, I do seem to have noticed quite a lot of corrugated iron in the last few weeks. 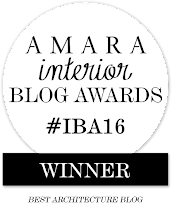 I can’t resist sharing one more example, even though it is in a way going over ground covered by this blog before. The Severn Valley Railway runs between Bridgnorth and Kidderminster on track that originally formed part of a line linking Hartlebury in Worcestershire with Shrewsbury. The line became part of the Great Western Railway in the 1870s and was closed in 1963 (it had already been scheduled for shut-down before the wholesale closure of British railway lines that took place in that year). Part of the line was reopened as a heritage railway in 1970 and an extension to Bewdley followed in 1974. In the early 20th century the Great Western Railway used small corrugated-iron buildings as stores, as lamp rooms, or as shelters on the platforms of some of its smaller stations and halts. I previously posted about a pair of these pagoda shelters at Denham Golf Club station in Buckinghamshire. Here’s another – but instead of an original example from the early 1900s, it’s a modern one dating from the "heritage" phase of the Severn Valley Railway. 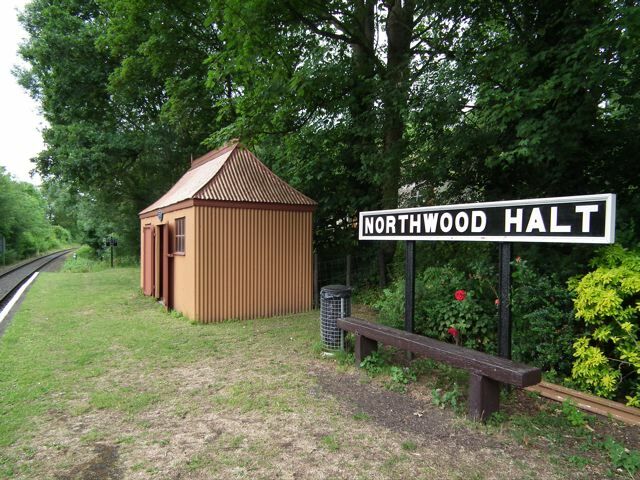 Northwood Halt was originally open between 1935 and the line closure in 1963 and during this period waiting passengers sheltered in a wooden hut. When the revived Severn Valley Railway was extended to Bewdley in 1974 the halt was reopened, and this pagoda shelter was put up in 2006 to replace the dilapidated hut. It is said to be the first all-new pagoda shelter to be erected since 1948. The platform sign is new too, but its cut wooden letters are very similar to those on its predecessor. The ensemble makes a welcoming sight for those who wait in rain or shine for one of the Severn Valley Railway's steam- or diesel-hauled trains. A recent post at The Dabbler dealt with plotlands, a form of development that became popular in the early years of the 20th century as a way of offloading unprofitable farmland. Estate agents and speculators parcelled up fields as small plots, on which people – often city-dwellers who wanted a place in the country – could build a home, knock together a chalet, or start a smallholding. Plotland houses were often self-built of timber; corrugated iron was frequently in evidence, too; some were even cobbled together from old railway carriages. Detractors referred to them as shacks, but they provided a rare opportunity for people with a tight budget to build (and in the days before the “property-owning democracy” own) a home – their buildings form a fascinating if unspectacular vernacular. Probably the best known plotland developments were in Southeast England. Peacehaven in Sussex is a maybe the most famous. The Dabbler mentions Jaywick and other Essex plotlands. There are also examples in the Thames Valley and, as I was reminded yesterday when my travels took me through Bewdley, in the Severn Valley too. I knew about this particular development from a memorable film by Jonathan Meades, Severn Heaven (1990), part of his Abroad in Britain Series. Meades revelled in the rich bricolage that the owners of these houses had created, the melange of corrugated iron sheds, garden ornaments, chain-link fences, and boskage, both old and imported. Back in 1990 the houses themselves looked crudely but lovingly hammered together – now many have been replaced by slick tongue-and-groove structures that could almost be part of a pine-lodge holiday park. But some of the old houses remain. 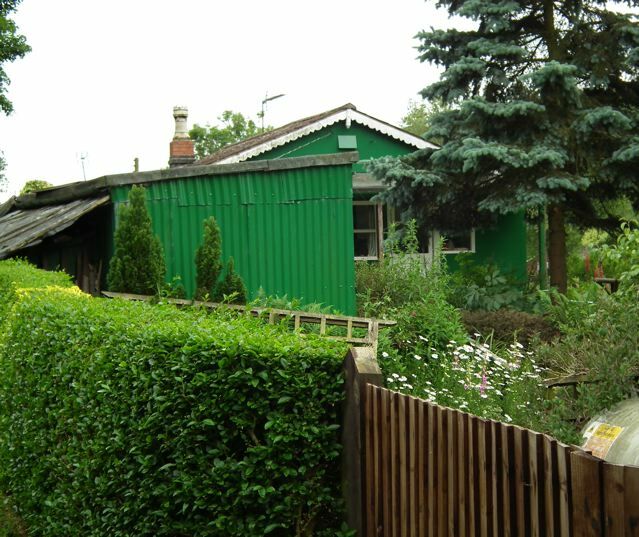 Here’s one, lovingly painted in green with fancy white bargeboards, clinging to the slope below the Severn Valley Railway, which swishes and hoots in the background. There’s more about this plotland development at the Liberal England blog. Border country: Wales a short distance beyond the nearby ridge. Thick pasture. Black and white villages. Castles on hills. And also, here at Richard’s Castle, a church on a hill, with a solid square tower a few feet away. 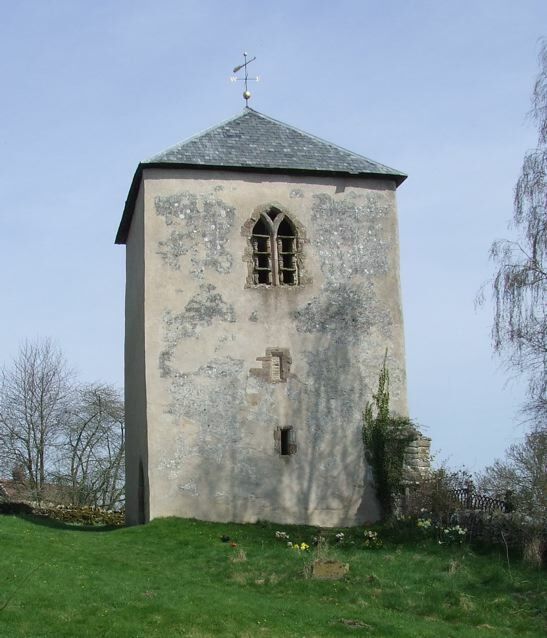 Herefordshire has a number of detached church towers like this one of around 1300. Their plain architecture – here there’s just that Y-traceried window to suggest a date and a style – quite different from what we normally expect of a church tower, different too from the carved and pewed church next door. It’s a bell tower but also a lookout and a refuge – no doubt the priest needed somewhere safe to go when the tensions between English and Welsh broke into violence. It’s a small building that looks as if it means business. No doubt the Welsh and their English opponents meant business too.